I have a reasonable collection of C64s - 3 breadbins and 2 C64Cs - but out of those only two are fully functioning, so I've become quite aware that these machines are getting flakey in their old age. I've sunk quite a lot of hours into attempting to diagnose the faults and finding replacement bits online, with mixed success. Given that it's no surprise that I was eagerly awaiting the release of the C64 Reloaded mk2. one or two SIDs - 6581 and/or 8580, two can be used at the same time for dual SID audio! The build quality is very good, and setup was a doddle. The ZIF chip connectors mean it's simple to insert and remove chips - no more nervewracking levering! The board even auto-detects what's installed which means no need for jumpers. One thing I have yet to do is try connecting to the Remote Menu. We only have Macs at home, and the Reloaded mk2 wiki contains some dire warnings about using the USB driver on OSX. Caution: The Prolific driver for macOS is really crappy. It keeps your system from shutting down, crashes if you insert/remove the USB connector a second time, and since there is no automatic de-installer, it is hard to remove from the system. You have been warned: We do not recommend to use this driver. I need to try setting up a Linux VM to see if I can connect via that. Overall I've been really impressed. Going forward this will be my C64 workhorse, and I look forward to getting into the more advanced options. The one thing that is a bit annoying is that when placed inside a breadbin case, the power switch is too close to the bottom edge which makes powering on/off and resetting tricky - I'm sure I can figure out a way to improve this though. 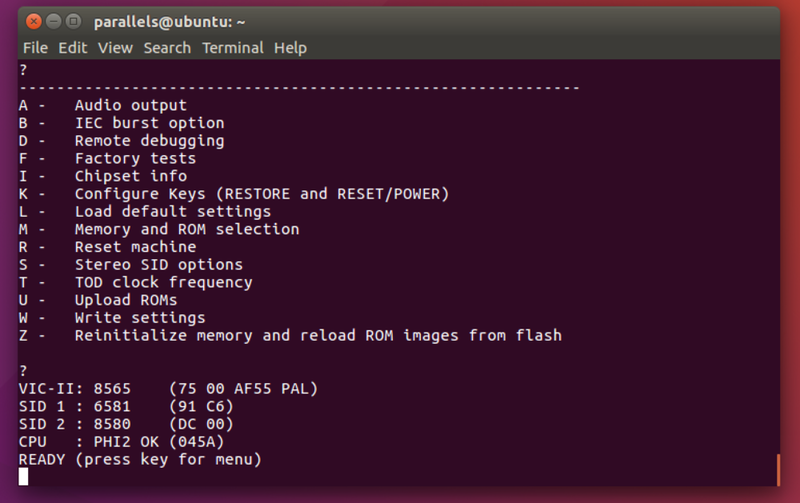 Fearing the consequences of installing the USB drivers on my Mac, I setup an Ubuntu VM and that worked a charm. I followed the wiki's advice and used minicom. Once the USB is connected and you power on the C64 you get a little welcome message (I'm pretty sure you can connect it at any time). The menu allows you to configure a number of things, including the behaviour of short & long holds of the "reset" button (power button down is off, up is on, and there's a further debounced up position which by default resets the machine), and enabling dual SID mode. You can even upload custom kernal and character ROMs. I changed the reset button to switch between my two SID chips and discovered with some delight that these can be switched at runtime without interferring with whatever is running. This is very very cool as it means I can go back and forth between the 6581 and 8580 chips and hear their different characteristics. Details of the chips installed. The various SID config options.